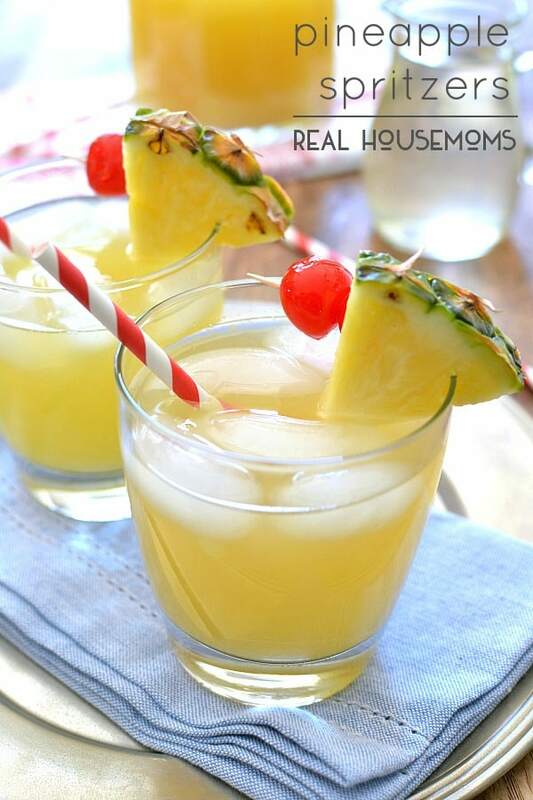 Pineapple Spritzers are sweet, refreshing summer mocktails that are perfect for the whole family! Hey, everyone! It’s Cathy from Lemon Tree Dwelling, and I’m so excited to be sharing my first post here at Real Housemoms today! I don’t know about you, but now that warmer weather is in the air, I have one thing and one thing only on my mind: summer cookouts! Of course, we all know that a good cookout is not just about the food. It’s about the people we’re with and the fresh outdoor air and the beauty of the sunset and the fun of it all. And….it’s about the drinks! 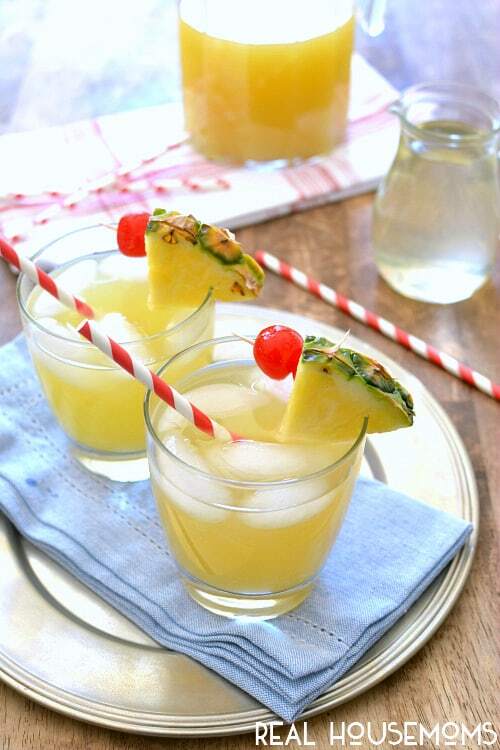 These Pineapple Spritzers are the perfect drink for summer cookouts. 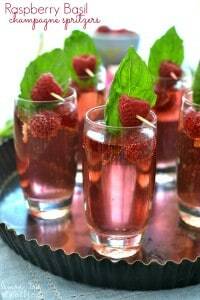 They’re sweet and refreshing, with a burst of lemon and just the right amount of fizz. And best of all, they’re a drink the whole family can enjoy. So make a pitcher of them and drink up. After enjoy your first cookouts of the season! I know I will! Combine 1/2 c. sugar and 1/2 c. water in small saucepan. Squeeze in juice of 1 lemon; cool in pan. 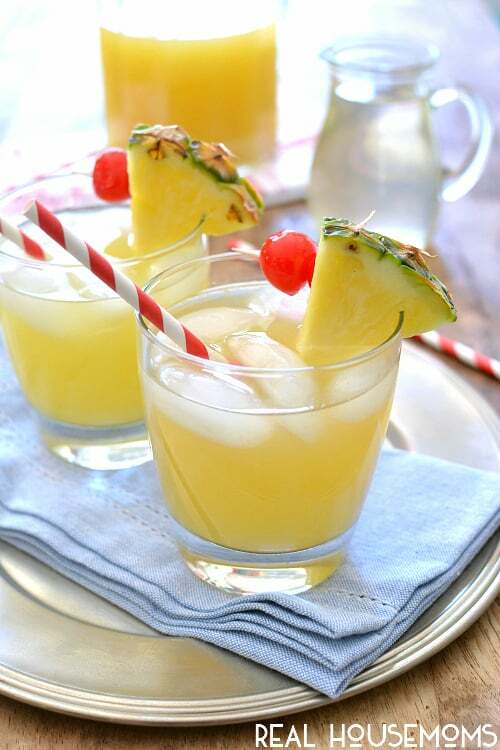 In a small pitcher, combine pineapple juice, sparkling water, and lemon simple syrup. 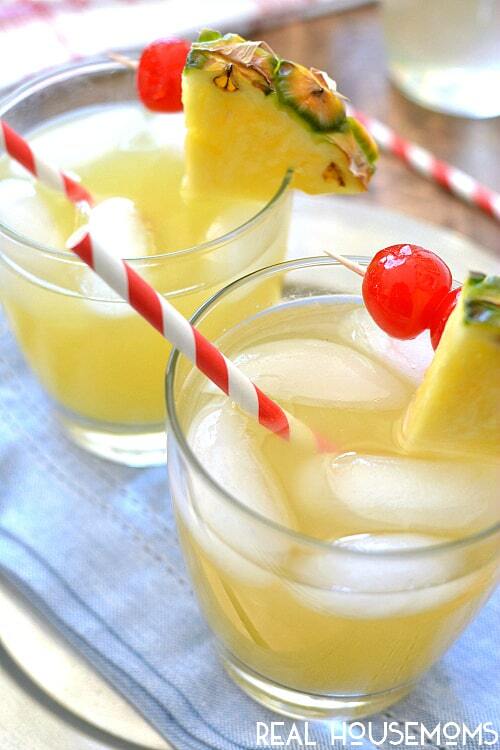 Pour into 4 glasses, add ice, and garnish with pineapple wedges and cherries. 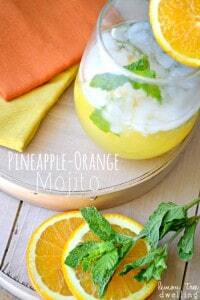 You may also enjoy these delicious summer drinks!